Bobby Lutz grew up on his parents’ dairy farm, and since 1975, he has owned and operated his own dairy farm on Fairfield Road, with the help of his son and grandson. 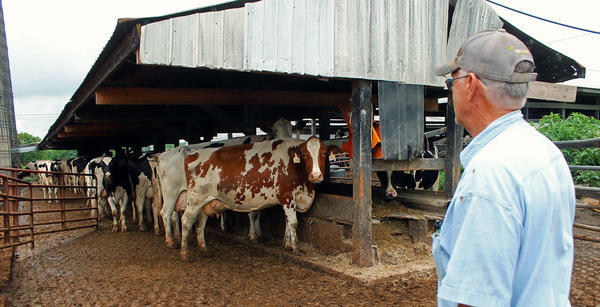 Bobby Lutz watches as his dairy cattle feed at his farm on Fairfield Road, which he has owned since 1975. His father was also a dairy farmer, and his son and grandson work the herd with him. Now they’re wondering how long their way of life will last. “It’s all we’ve ever done,” Lutz said. Unless they can find a buyer for their milk closer to home, though, they may have to do something else. He figures he might be able to make a living growing soybeans, but his son and grandson would have to get other jobs. Row crop farming on a small scale wouldn’t produce enough income for all of them to live on. He might also have to sell some equipment and cancel some insurance. And if he has to sell his herd of Holsteins, he hopes he can hold on at least until winter, when they might bring better prices. Lutz, 77, is one of a dying breed of family dairy farmers. Once Nelson was known as a big milk-producing county. There were hundreds of dairy farms here. “Forty years ago, there were nine on my road,” Lutz said. Now there are only three in the whole county. Like most Nelson County dairymen, the Lutzes sold to Dean Foods in Louisville for many years. But in February the Dallas-based company sent its Kentucky producers a letter notifying them their contracts would expire in only 90 days. The reasons were that Walmart was about to open a big milk processing plant near Chicago and that production of milk was outpacing consumption. Last week, the state Office for Employment and Training reported that it had received a closure notice for the Dean Milk Company plant in Louisville, with a resulting loss of 76 jobs. That doesn’t include the jobs lost on the farms. In the past couple of months, most of Dean’s local producers sold their herds and got out of the business. Among them were Warren Cheek, whose family had been raising dairy cattle since the early 1800s, and who sold Bobby Lutz and his family one of their farms. Also out of business are Bobby’s brother, Billy Lutz, Terry Waldridge, Greg Brothers, Keith Lanham and others. Two farmers in Nelson County, Lellan Barlow Sr. of Bardstown and Jim “J.” Campbell of Bloomfield, were unaffected because they sell to another buyer, Dairy Farmers of America, which sends their milk to a plant in London, Ky.
Dean gave its producers a 30-day extension, and they used the time to look for other buyers, assisted by the Kentucky Dairy Development Council. DFA had the Dean producers apply to see if they could meet its criteria, but DFA took only four from Kentucky, in Hart and LaRue counties. A farmer-owned cooperative, Scioto County Cooperative Milk Producers Association in Hillsboro, Ohio, ended up taking seven producers, including Lutz, to make up a semi-load a day, which will be hauled to West Virginia, starting this week. The irony of it is that in hauling the milk 200 miles one way to Charleston, W.Va., the trucker will have to pass a big milk plant in Winchester, which also gets its milk from out-of-state producers. Barlow said it’s sad what’s happened to other dairymen. Like Lutz, he’s 77 and he, too, would like to keep farming a little longer. He said his farm manager, George Spalding, would like to keep milking his cows for another five years.